Coming in a fancy shmancy wooden box with a burned-in label, and a matching T-shirt, is this Portland State IPA from Oregon's Rogue Brewery. 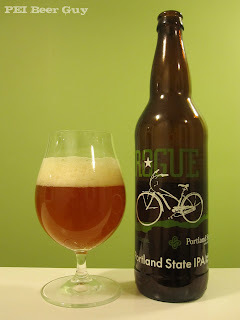 On the bottle, they claim that this beer is an all-local effort, having even the bottle made locally. It's somewhat ironic that they delivered this to my door - 6082km away. But, hey... I'm not complaining. At first, this beer is super-clear. There are gobs of sediment in the bottom, though, that make it a bit cloudier as this brownish-amber brew wears on. It has a tall, off-white head that has large bubbles in it forming almost right away, taking their time before popping. The nose? Hops - a mix of pleasant citrus and something that reminds me of my cat's litter... really, something rather pee-like. It's not enough to stop you in your tracks, but it's there. The flavour? Whoa. That was unexpected. It's really orange & tangerine-y. I think the Maris Otter malt is playing a nice role in balancing things out. There's some caramel / light roast notes in there, too. It's different. There's something "luxurious" about the malt profile of it - like maple syrup without the maple, if that makes any sense (no, not just syrup). The carbonation's a bit of a tingle on the middle of the tongue. The body's on the lighter side of medium, with a slightly sticky finish. Overall? Nice. Not a wower, but nice. How could you possibly give this is an okay review when it smells like a cat's litter box? I know, right? That was my intial thought, too - that this may be so-so to bad. Luckily, though, it was a minor whiff... by the end of the brew, I enjoyed its flavours (etc.) overall. Did you order this one from rogue.com? Not me, my wife. She ordered me three of their brews for Christmas. I hear ya. The shipping wasn't atrocious, but the COD / "brokerage" fee was a surprise to her. She said she'd probably never do it again unless it was REALLY special. I'd probably never have done it for myself. So... it was a nice surprise she did!